Dye-free, perfume-free liquid laundry detergent is specially designed for sensitive skin. Provides your fabric with a great clean that is gentle on your skin. Removes more residue from dirt, food and stains than alternative dye-free, perfume-free detergents. Application: Laundry Soap; Applicable Material: Fabric; Dirt Types: Dirt; Grease; Organic Matter; Stain; Scent: Unscented. 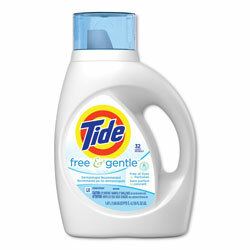 Liquid Laundry Detergents from Tide! 701 In Stock today.